Se você já obteve conteúdo exclusivo através de ofertas pré-venda ou edições especiais, talvez você já tenha adquirido parte do conteúdo deste pacote. Requer Assassin’s Creed Syndicate (Versão NÃO Steam) para jogar. With over 45 minutes of gameplay, this pack contains missions, weapons and gear to expand your Assassin's Creed Syndicate experience. Starting with The Darwin and Dickens Conspiracy Missions: Embark on two pulse-pounding missions that will take you into the inner sanctums of London’s most influential men. Defend Charles Darwin’s discoveries from those who would kill to silence him. And help the friend of legendary writer Charles Dickens, keep a secret that could get him killed. This pack also includes the Runaway Train Mission: as a runaway train thunders through London at top speed, you must find and fix the train’s critical flaws before you run out of time. This mission offers 15 minutes of gameplay. 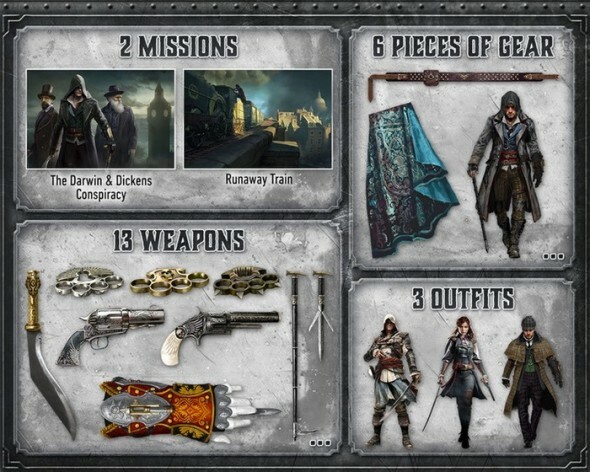 Finally, this pack comes with a variety of equipment & weapons for both Jacob & Evie: 13 weapons, 6 pieces of gear and 3 outfits. If you have obtained exclusive content through pre-order offers or collector’s editions, you might already own part of the content of this pack. The Darwin & Dickens Conspiracy: Pacote com duas missões especiais, onde é preciso defender as descobertas de Charles Darwin daqueles que poderiam mata-lo para manter o silêncio. Ajude o lendário escritór Charles Dickerns, que descobriu algo que não devia, agora precisa guardar o segredo, ou pagar com sua vida. Runaway Train: Com um trem desgovernado em alta velocidade através de Londres, você deve encontrar e corrigir falhas críticas antes que seja tarde de mais. Itens novos: São 13 armas, 6 peças e 3 equipamentos totalmente novos para Jacob e Evie.